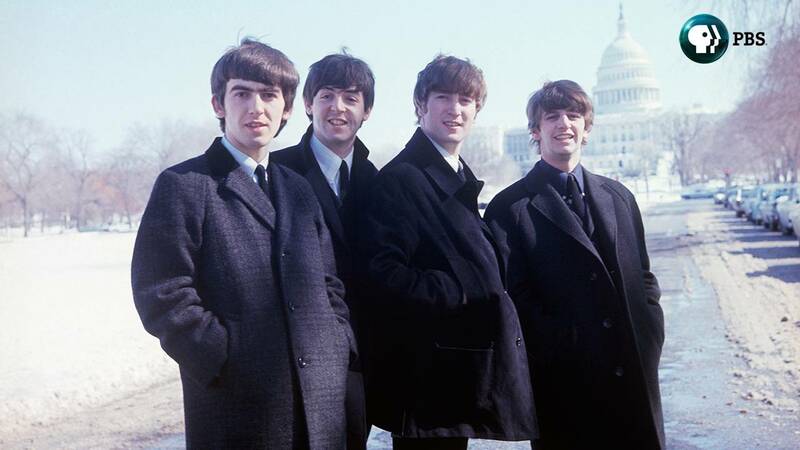 The Beatles in Washington DC, February 1964.© Apple Corps Ltd.
ARLINGTON, VA, September 25, 2017 - PBS today announced the U.S. broadcast premiere of Academy Award®-winner Ron Howard’s authorized and highly acclaimed Emmy® Award and GRAMMY Award®-winning documentary film about The Beatles’ phenomenal early career. THE BEATLES: EIGHT DAYS A WEEK – THE TOURING YEARS premieres Saturday, November 25, 8:00-10:30 pm ET (check local listings) on PBS. The film will be followed by an encore broadcast of SGT. PEPPER’S MUSICAL REVOLUTION,10:30-Midnight ET on PBS, which continues the story beyond The Beatles’ touring years, during the months the band spent creating Sgt. Pepper’s Lonely Hearts Club Band, a groundbreaking masterwork that became popular music’s most universally acclaimed album. The Beatles began touring Europe in late 1963, after an extraordinary arrival on the British scene in 1961 and ‘62. However, it was their much-heralded “Ed Sullivan Show” appearance on February 9, 1964 that caused The Beatles’ popularity to explode. By June, the band had commenced their first world tour, and continued on a relentless schedule for two subsequent years. By the time the band stopped touring in August of 1966, they had performed 166 concerts in 15 countries and 90 cities around the world. The cultural phenomenon their touring helped create, known as “Beatlemania,” was something the world had never seen before and laid the foundation for the globalization of culture. THE BEATLES: EIGHT DAYS A WEEK – THE TOURING YEARS was produced with the full cooperation of Paul McCartney, Ringo Starr, Yoko Ono Lennon and Olivia Harrison. White Horse Pictures’ GRAMMY Award®-winning Nigel Sinclair, Scott Pascucci and Academy Award®-winner and Emmy® Award-winner Brian Grazer of Imagine Entertainment are producers with Ron Howard. Apple Corps Ltd.’s Jeff Jones and Jonathan Clyde are executive producers, along with Imagine’s Michael Rosenberg and White Horse’s Guy East and Nicholas Ferrall. Immediately following EIGHT DAYS A WEEK is an encore broadcast of SGT. PEPPER’S MUSICAL REVOLUTION, 10:30-midnight ET (check local listings) on PBS. Hosted by award-winning British composer, author, music historian and broadcaster Howard Goodall, the film looks back at the creation and ongoing influence of Sgt. Pepper’s Lonely Hearts Club Band, released on June 1, 1967. Hailed as a landmark achievement by critics worldwide, the album won four GRAMMY Awards, including Album of the Year, and ranks #1 on Rolling Stone’s 500 Greatest Albums of All Time as “the most important rock & roll album ever made.” The documentary conjures up the psychedelic, phantasmagorical world of Sgt. Pepper and provides context for the culture of the day, showing how the album and its classic songs, including “Lucy in the Sky With Diamonds,” “She’s Leaving Home” and “A Day in the Life,” became a driving force within that culture. An Apple Corps Ltd. production, SGT. PEPPER’S MUSICAL REVOLUTION is directed by Francis Hanly and produced by Jonathan Clyde and Martin Smith.